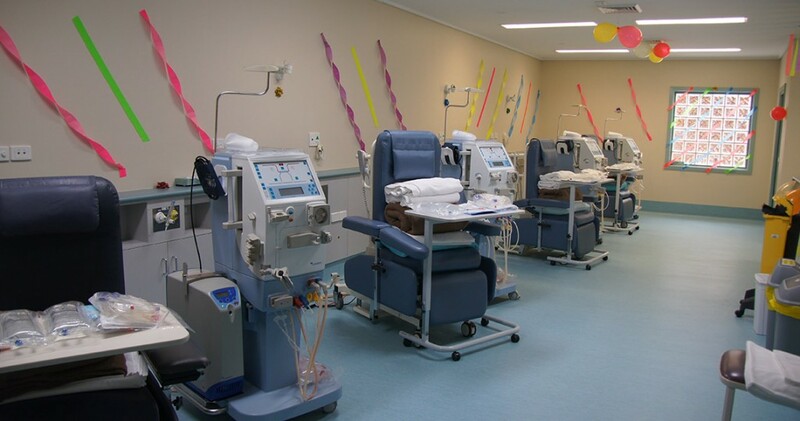 Robinvale District Health Services (RDHS) recently began operating from the newly renovated Dialysis Unit. The renovations have expanded the existing unit to hold 4 chairs and improved the nurses’ station and storeroom facilities. RDHS conducts dialysis with a staff/patient ratio of 1:3 in our unit that was previously only suitable for a ratio of 1:2. The service is currently operating 3 times per week over 2 shifts for 7 regular patients. This number varies with support being offered to other regional dialysis units and catering for visiting patients were able. There is a local waiting list with an average of 10 patients considered to be pre dialysis at varying stages. The expansion of the unit to 4 chairs allows us to conduct a more efficient service and meet the infection control and OH&S expectations of a dialysis unit – which were not previously being met. It is recognised that safe and cost effective treatment is delivered with a nurse/patient ratio of 1:3. Space for the 4th chair allows for setup for the incoming shift and back up in the event of machinery breakdown or preparation for a VRE/infectious patient. These are considered very important factors in a satellite site such as at Robinvale. Evidence supports the long term need for dialysis service with community demographics and surrounds into the future. Nursing Services Officer – Binu Joy oversees the dialysis management and stated that staff and patients were happy with their new environment and were just waiting for a few finishing touches – such as individual TV’s for the patients.